From Sales to purchasing, returns to write offs, all inventory changes are tracked by Booklog. You will always have real-time data for each item you carry. Historical data is maintained indefinitely, even for deleted items. Did something come back into style? Booklog will reactivate the old deleted record when you start carrying it again to maintain a comprehensive history. Our innovative inventory search window offers the unique advantage of accessing your entire inventory at any time and from any part of the program with a single keystroke or click of a button. 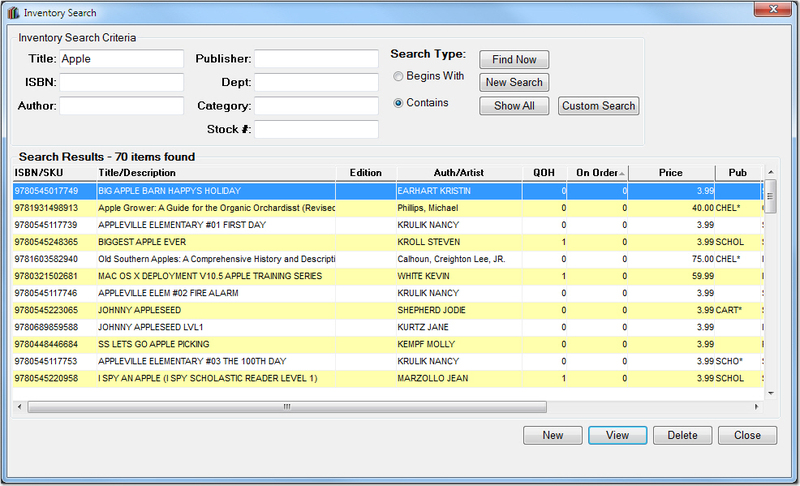 The search window quickly returns a summary listing of all items or items that meet search criteria you choose sorted by ISBN/SKU, title, category, vendor, style, or other attributes.